01/12/2018 | Global Collaboration, News, World in WAIMH | Huber, A. The session was framed around three questions designed to highlight the universality of infant, parent and staff needs, while keeping in mind the unique values and beliefs of families and workers from different cultural backgrounds. What are infants’ universal needs and rights? What 5 items can enable staff to identify risk? A South African Basic Infant Mental Health Screen. How can we work respectfully with families? 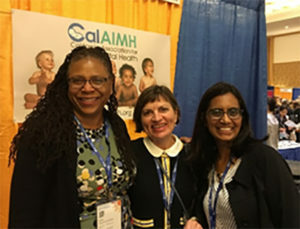 The three board members showcased the WAIMH Declaration on Infant Rights, raising awareness among conference attendees of WAIMH as an organisation advocating internationally for infants, their caregivers and those working in the field. The session was well-received by several hundred conference delegates who attended the session, including several Zero to Three Board members. Dr. Huber, Berg, and Manly spent extra time after the session answering questions and talking with interested participants. The session marked the start of a working relationship between WAIMH and Zero to Three through shared confence presentations. 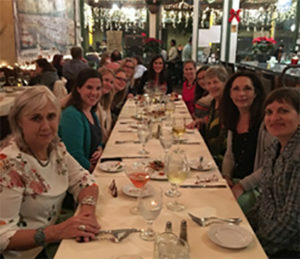 As Affiliate Representative on the Board, Anna also took opportunities to meet with Affiliate members of WAIMH who are members of the Alliance for the Advancement of Infant Mental Health, Inc.® and to give the newly approved Californian affiliate group an advance welcome. Pictured below are WAIMH and Alliance members from New Mexico, Michigan, Rhode Island, Colorado, Minnesota, Arizona, and Connecticut enjoying dinner and welcoming Anna to the USA. The second picture shows WAIMH board affiliate representative, Anna Huber (centre), welcoming California Association for IMH representatives, Barbara Stroud (left) and Monica Mathur-Kelluri (right) to the WAIMH affiliate family.